Our logo and truck paint design are compliments of the talented Kelly Kuhl, graphic designer & fashion designer, and will bling out our exterior. Next step, meet with some friends at Protospace makers community in Calgary and see about building some interesting lights, and equipment. Designing a Glass Studio... In a Truck! We bought a truck!! A huge 26 foot moving truck that very soon will house our hot glass blowing equipment and be the stage for our live glass blowing shows. It is going to be retro fitted with a sliding wall that will become a stage, where we will make glass art from molten glass that 1000+ degree Celsius. The Glass House Collective is coming, stay tuned for more updates. 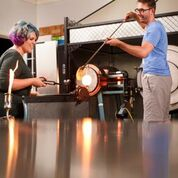 With a passion for blowing glass and making fine art, Mandy Patchin and Kai Georg Scholefield have founded the Glass House Fine Art Collective. A company of rogues bent on bringing the drama and intensity of hot glass work to world. Today, we are born... (and a little melodramatic).